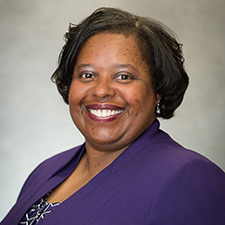 Schnell R. Garrett, a 1996 graduate of Kentucky State, said she began working in the hospitality industry but later decided a career in higher education was what she wanted to do. Garrett said she started out as a financial aid coordinator at a private career college and then earned a master’s in college student personnel from Bowling Green State University in Ohio. “I have worked in student affairs since in a variety of different areas including student activities, financial aid, Greek life, housing, admissions, advising and student conduct,” Garrett said. Garrett currently serves as the director of student life at Howard Community College in Columbia, Maryland. “I oversee the day-to-day operations of the student activities on campus, including our wellness center, game room, leadership programs, food pantry, new student orientation, etc.,” Garrett said. One of Garrett’s fondest memories at Kentucky State is crossing Delta Sigma Theta Sorority, Inc. in April 1994. While at Kentucky State, Garrett said she learned how to be a scholar and the importance of building and maintaining a network of positive people. If she could offer advice to current or future Thorobreds? “Take full advantage of all the resources that are available to you, including the faculty, staff and your peers,” Garrett said. Garrett said Kentucky State was a critical investment in her career.